"Fully matured, totally developed people, witnessing freely the Values of Christ and His Gospel in Faith, Hope and Love". Bounded on the west by the Bay of Bengal and Rakhine State, South by the Indian Ocean, East by the line of Bogale,Maubin, Pantanaw and Nyaungdon Townships and North by the Lines of Myanaung and Kyankin Townships. The Diocese of Pathein (Bassein) was officially erected in 1954, when His Holiness Pope Pius XII established the Catholic Hierarchy in Burma. Apostolate was first commenced among the Karens of the Delta area in 1844 by an Italian Priest, Fr Dominic Tarolli, who had come over to Burma with Bishop Cao in 1831. Later in 1846, he was joined by Fr. Pogolotti - an Oblate cleric recently ordained at Amarapura in 1843.Myaungmya was fixed as their Headquarters or Mission Centre. Fr. Tarolli, however, was made prisoner during the second Anglo-Burmese War in 1852. The mission establishments were totally destroyed. On the arrival of Bishop Bigandet to Burma in 1856, he appointed Frs. Lacrampe and Naude to evangelize this area. At the cost of much sacrifice and toil, early intrepid pioneers Frs. Lacrampe, Naude and Tardivel managed to establish a flourishing mission. Kanazogon became the Mission Centre for Fr. Lacrampe. He soon set up a Church, a clergy house and a school and by 1862 there were already one thousand Catholics. Fr. Naude, instead, went across to Maryland and opened up a Mission there. Other outstanding missionary figures like Fr. Tardivel, Fr. Bringaud, Fr. Rouver, Fr. Maigre and Fr. Boudard did much to spread the Good News throughout this difficult virgin area; a name that stands out at this time was that of Fr. George D’Cruz who initiated the Apostolate of the Press among the Karens. The tireless and zealous efforts of those pioneers compeled with the sweat and toil of Burmas’ own Sons-our native Priests, the Church in Bassein (Pathein) steadily developed. 1954 was a memorable year and one of tremendous joy-the first ever Bishop of Pathein- Msgr. George U Kyaw was consecrated Bishop. Bishop George U Kyaw administered the Diocese from 1955 to 1967. Fr. Joseph Mahn Erie succeeded him as the next Bishop. He was solemnly consecrated in St. Mary’s Cathedral in Yangon (Rangoon) by the Apostolic Delegate, Msgr. G. Caprio, on June 12, 1968. Bishop Mahn Erie governed the Diocese till his subsequent resignation in the middle of 1982. The elderly priest, Fr. Sequeira, Later in 1985 took over as Bishop of Pathein. On April 27, 1988, Fr. John Gabriel was appointed Auxiliary Bishop of Bassein. A few years later, Bishop Sequeira had to retire due to his advanced age and Bishop John Gabriel was installed as the Bishop of Bassein on February 23, 1992. Unfortunately Bishop John Gabriel lasted a scant six years in his Episcopal Office. He hardly lived long enough to see the fruits of his toils and labours. He died on August 14, 1994. On his demise, Msgr. Paulinus Mahn Ei Shaung was elected Vicar Capitular of the Diocese of Pathein. Finally after a couple of years, Bishop Charles Bo, SDB (the incumbent Bishop of Lashio) was appointed to the See of Pathein as it’s 5th Bishop-on May 24, 1996. He was officially installed on August 25, 1996. 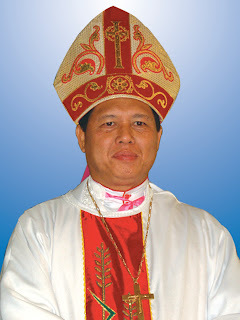 Far-sightedness, being energetic and willing to serve and develop the Diocese of Pathein, His Excellency Bishop Charles Bo, SDB, took a faith and daring step to animate, pushed up and convened a Diocesan Synod December 12-21, 1997, that has been giving birth to all and total development of the Diocese.